Despite its promising new mechanics that make conversation a game of strategy, the interaction between its characters lets The Council episode one down. Irritations don't entirely diminish the charm and ambition of the entire endeavor. I was able to get into this game in a way I've been unable to with adventure games for the last few years. It was a treat to play, and I can't wait for the remaining four episodes. The Mad Ones' episode lays the foundation of a potentially intriguing mystery narrative, part An Inspector Calls, part Murder on the Orient Express. The Social Influence system, if implemented well through the rest of the episodes, really could be a game changer for narrative adventures, evolving a genre that has needed fresh ideas for a while. This first episode of The Council is a promising new twist in the genre of narrative adventure, in which your choices and the development of your character really matter. The opening episode isn't exactly the most gripping of affairs, as this slow burning, political drama takes a while to get going and isn't helped by poor presentation and dull puzzles. But there is potential here for an interesting story to be told in future episodes. 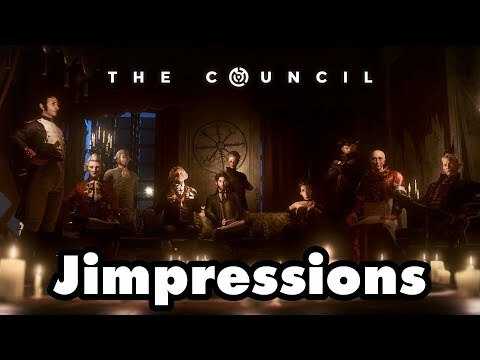 Though rough around the edges overall due to some performance issues, the first episode of The Council has laid a strong foundation for this intriguing story and fun gameplay to continue down the line. The first episode of The Council is a pleasant surprise. Big Bad Wolf has succeeded in inserting a snappy roleplaying system into a historical investigative-style narrative adventure, and the implications are surprisingly original, brilliant and ambitious. There are minor flows in the script and technical wise is quite clumsy, but it's a good opening episode indeed. The Council Episode One: The Mad Ones is an interesting interactive adventure, which bringing fresh ideas to a stagnant genre. It could've been better without plot holes and outdated character models. Still, it's a great start. If Cyanide Studios can smooth out the creases and keep delivering the narrative goods, I could see The Council becoming the next big narrative-driven franchise. It's up to Episode Two to keep the momentum going. If you can ride out the clunky voice overs, The Mad Ones is a decent introduction into the world of The Council. The novel mechanics and engaging plot are ripe for further exploration over the other upcoming four episodes. If they can deliver a worthwhile story over the remaining four episodes, The Council may go down as the new benchmark for narrative adventure games. While missing some of the polish other games might have, The Council feels like it could be the next step in the genre thanks to branching narratives that feel much weightier than before and a mystery you can't help but be drawn into. The Council has impressive ambitions – even if its execution is not up to scratch. You'll already know whether its alternate history backdrop appeals to you, but it's the RPG elements that threaten to disrupt the narrative genre. We already like what this series is doing, but the writing and voice acting leaves a little to be desired. That said, this is a solid start, even if it is a bit too early to come to any conclusions about the overall story just yet. The Council Episode One is a thunderously promising start for this fresh, sophisticated and intelligent take on the narrative adventure. The Council is a good attempt to refresh the narrative adventure genre, that starts to feel a little bit too repetitive these days. Although it's not based on a popular intelectual property, it does offer a story full of mystery and some interesting characters. Despite my frustrations with its shortcomings, I want to see where The Council leads me, and if it manages to deliver a narrative payoff in spite of itself.